Maybe its the same where you live, and then again maybe its not. But where I live one knows his standing in the community by how many zucchinis and tomatoes he receives from neighbors and co-workers during this season of harvest. I call it the Zucchini-Tomato Friendship Index. If you haven't received any home grown produce by now, well I'm sorry to say this, but you should probably consider moving...sooner than later. Being new in the neighborhood this year we have been surprised and delighted to have our kitchen counter covered in zucchinis and tomatoes. Too bad I'm the only one in the family that loves to eat tomatoes. Oh and don't forget the multiple boxes of peaches from the neighbors trees that just show up on our doorstep by the neighborhood fairies and elves. Mmm...delicious!!! Ahh...people do like us! ...in spite of the strange guy in our backyard often hidden in camo netting and apparently taking photos of tree branches. Update: Another kind neighbor just dropped off a huge bag of his home-grown pears. Awesome!!! Good neighbors rock! I am very glad to be a new follower of this blog. I check blog postings very early in the morning with my first cuppa, and the humor and diversity I find on this blog brings a smile to my face. It's a great way to begin my day!! Thank you! Oh my! 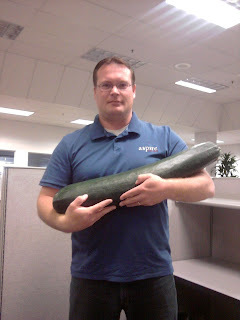 Now that is a zucchini. How lucky you are to live in a neighborhood where the neighbors are so very generous. Enjoy your fresh vegetables grown with love! @KaHolly - Ah shucks...that's sure kind of ya to say. We're glad to have great readers like you! @Julie G - We do have wonderful neighbors! We didn't have a garden this year, except for a large pot of basil. We are over-flowing with basil now and there are only so many recipes that call for basil. We've been putting basil in everything. I think my sweat even smells like basil now. Now we'll have to inflict our neighbors with all the extra basil. If you want to know which neighborhood I live in...just drive to Bountiful Utah and follow the smell of fresh basil! Wow...love to see organic produce used productivity. It would be very nice to have home grown peaches left on your door step, but in northeast Alberta it is too cold for growing peaches. But we get cucumbers and zucchinis aplenty. @Jean - homegrown produce always tastes so much better than store-bought stuff. @prairebirder - too bad you're missing out on the peaches, but enjoy all the squash! @Rebecca - loved your comment! Do you have any good basil and zucchini recipes we could try out!